Bike Racks / Cycle Carriers. Lights / Lamps / Lenses. 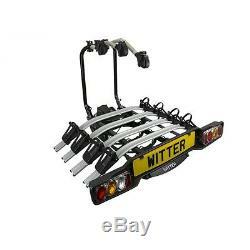 Witter ZX504 Cycle Carrier 4 Bike Foldable Portable Tow Bar Mounted Bicycle Rack. 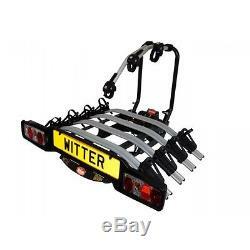 Witter ZX504 - 4 Bike Cycle Carrier. The Witter cycle carrier range is platform based and is available as two, three and four bike carriers. Roll-It - Portable, the carrier can easily be moved around on built in wheels when not in use or when manoeuvring into position. Load-it - The carrier loads vertically onto the towball; this reduces back strain and makes the attachment incredibly simple with minimum effort. Clamp-it - Using a unique clamp down action it fastens to the towball with the same force automatically every time it is lowered into position. Tilt-it - The platform will tilt rearwards when in use to facilitate boot access with or without the cycles loaded. Use-it - Simple and easy to use, minimum effort to install, designed specifically for one person attachment without continuous adjustments. Fold-it - The platform will fold up to reduce rearward clearance when not in use. Flip-it - The lighting board can be flipped down to display rearwards. Drive-it - The vehicle can be driven with the carrier attached in the fold up position. Fastens to the towball with the same force every time. Max load per Bike - 20kg. Portable, easily rolls on integrated wheels. Tilt-able to facilitate boot access with or without cycles loaded. Folds to reduce rearward clearance when driving or not in use. Trident Towing have many solutions to this common problem. We are a family run business established since 1976 with trained staff offering correct product information & advice on all aspects of our entire product range. We always strive to put quality before quantity and as a result have many long term customers and achieve much of our sales through repeat business and word of mouth recommendation. Card charges will appear on your statement as Trident Towing. If you have ordered multiple items they may arrive separately. We will do our best to get all orders sent out as quickly as possible. Occasionally we find ourselves having to withdraw an item because it has become obsolete or has been discontinued. If you have placed an order for an item that has been made obsolete we will inform you as soon as possible and offer you an alternative if one is available. We do not currently deliver to the following domestic regions: Channel Islands, Isle of White, Isle of Man, Scilly Isles, Scottish Highland, Scottish Islands & Northern Ireland. Due to the large range of trailers available we can not hold all models in stock, if there is a particular model you require use the ask a question feature to ask for the earliest available build date of the trailer you require. Items must be unused and in an as new condition with all packaging and labels attached. Please note that you are responsible for the item(s) you are returning until such time as they are received by us. If an item becomes faulty after a period of time then please contact customer services before returning the item. We will either repair or replace the item at our discretion. When a replacement item is required urgently, we advise you to place a new order on the website for the replacement item first. This will ensure that the goods can be despatched without delay in order to get them to you promptly. Trident Trailers Ltd T/A Trident Towing. Vinten House Target Business Centre Bircholt Road Maidstone Kent ME15 9YY. Opening Hours 8.00am to 5.00pm Monday to Friday and 8.00am to 1.00pm on a Saturday. The item "Witter ZX504 Cycle Carrier 4 Bike Foldable Portable Tow Bar Mounted Bicycle Rack" is in sale since Tuesday, March 24, 2015. This item is in the category "Sporting Goods\Cycling\Car Racks".